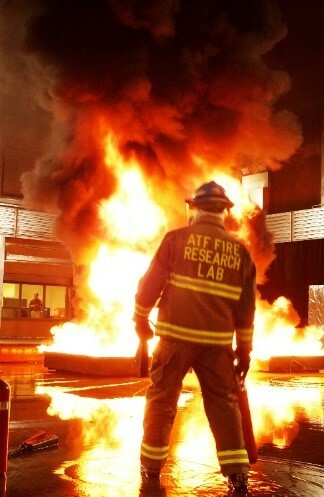 The ATF Fire Research Laboratory opened in 2003. It is the world’s only large-scale fire science research laboratory dedicated to fire investigation. The FRL is a qualified forensic laboratory, accredited to International Organization of Standardization17025 by the American Society of Crime Lab Directors – Laboratory Accreditation Board. The FRL state-of-the-art facility allows researchers to conduct analyses, experiments and examine evidence in support of fire investigations prosecuted in local, state and federal court systems. The Bureau of Alcohol, Tobacco, Firearms and Explosives’ (ATF) Fire Research Laboratory (FRL) opened in 2003. It is the world’s only large-scale fire science research laboratory dedicated to fire investigation. FRL engineers use its unique capabilities and sophisticated instrumentation to assist ATF special agent Certified Fire Investigators (CFI) with fire investigations. The FRL is a certified forensic laboratory, accredited to conduct analysis and testing related to fire scene reconstructions as well as electro-mechanical evidence examinations by the American Society of Crime Lab Directors – Laboratory Accreditation Board (ASCLD/LAB). ASCLD/LAB assesses laboratory capability using the International Organization of Standardization (ISO/IEC) 17025 General Requirements for the competence of testing and calibration laboratories, and the ASCLD/LAB International Supplemental Requirements for forensic laboratories. This one-of-a-kind facility includes state-of-the-art scientific instruments that allow researchers to measure data significant to fire behavior, including heat release rate, burning rate and smoke production. This data can be used to assist investigators in understanding fire development and progression. The facility offers a range of capabilities, from bench-scale fire measurement instruments to a 16,900-square-foot burn room that can accommodate a three-story structure. Its reconfigurable, small-scale test areas and bench-scale test equipment allow investigators to study large-scale fire behavior and perform engineering analysis and computer fire modeling for use during fire-scene analysis and test validation. 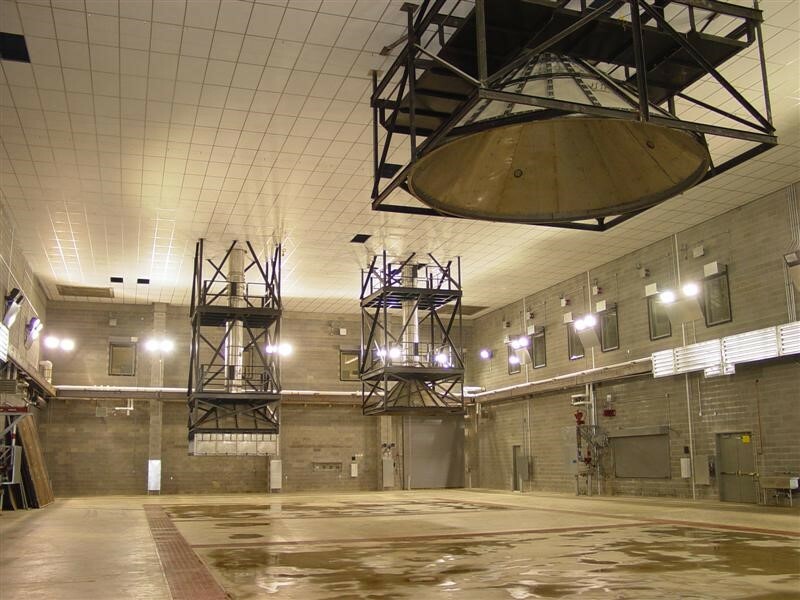 The FRL facility provides a controlled environment in which to test fire investigation hypotheses, evaluate fire scenarios and assess potential fire causes that investigators encounter in the field. Electrical testing laboratory to perform forensic examinations and facilitate testing and failure analysis of residential and commercial electrical products, components, equipment and wiring. State-of-the-art control room, fire safety suppression system, and onsite air and water pollution treatment facilities. There are environmental systems that process and cleanse exhaust air prior to release into the atmosphere, and the water treatment facilities eliminate the impact of runoff into the community by collecting and recycling water that is used to suppress test fires. State-of-the-art Data Acquisition System, which allows for over 2,300 channels of data to be collected every second. State-of-the-art 16-channel video collection system, which allows video to be captured in both Standard Definition (SD) and High Definition (HD). Additional video capabilities include high speed and FLIR thermal imaging cameras. Classroom and training areas for fire investigation and education programs. Support facilities such as shop areas, evidence storage, and instrumentation and conditioning rooms. FRL engineers specialize in fire protection, mechanical and electrical engineering, and are members of the ATF National and International Response Teams (NRT and IRT). These teams, composed of ATF CFIs, engineers, forensic scientists and special agents, provide federal assistance at the request of local, state and international jurisdictions responding to large fire scenes. In addition to supporting fire investigation casework, FRL engineers conduct scientific research in fire science and forensic science. This information is used to develop improved investigative techniques and is a central repository for fire research data. Additionally, FRL engineers provide training to hundreds of local, state, federal and international members of the fire investigative community every year. Training topics include fire dynamics, case studies, and electrical theory/examinations. The FRL works in close cooperation with research institutions worldwide to support joint research initiatives that are designed to improve fire investigation.